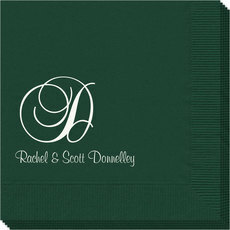 Sample shown is a Forest Green napkin with a White Matte imprint using ELLB typestyle and Bottom Centered positioning. Sample shown is an Ivory napkin with a Black Matte imprint using EIRS typestyle and Bottom Centered positioning. Sample shown is a Pale Pink napkin with a Copper Satin Foil imprint using ELED typestyle and Bottom Centered positioning. Sample shown is an Espresso napkin with a Copper Metallic foil imprint using ELED typestyle and Horizontal Centered positioning. 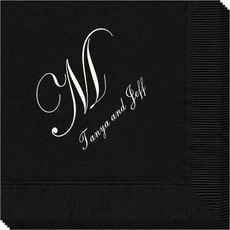 Set of printed guest towels with a larger single letter initial positioned over your personalization. Your choice of guest towel color, positioning and imprint color. Quality 3-ply guest towels you'll be proud to use or give. Approximate size 4.5" x 8". Guest Towels are shrink wrapped in sets of 50.